MANILA, Philippines – Snack food company Rebisco brings the most iconic Assorted Biscuits Tin Can — that multi-colored can of snacks that generations have always loved — to the next level by partnering with renowned Filipino contemporary artists to create the Rebisco Special Edition Designer Cans. Rebisco in its 55th anniversary collaborated with 4 local artists to create masterpiece called the Special Edition Designer Cans | L-R: Noric Ng, Rebisco Vice-President of Operations; Lady Luzano-Cruz, Category Manager; Roel Obemio, Artist; Migs Villanueva, Artist; Heart Evangelista, Host and Rebisco Ambassador; Lulu dela Peña, Marketing Communications Head; Chico Garcia, Host; Aris Bagtas, Artist; Joseph Bañez, Artist; Katherine Simundo, Rebisco Vice-President of Marketing. The grand launch of the special edition cans coincides with Rebisco's 55th anniversary. "These works of art aim to showcase the rich history and evolution of the brand, while using the can itself as a vehicle of expression." As a fledgling company, Rebisco started with very simple offerings of biscuits and crackers packed into a can with images of the biscuits. Over time, the packaging evolved, soon showcasing family-themed art works as well. 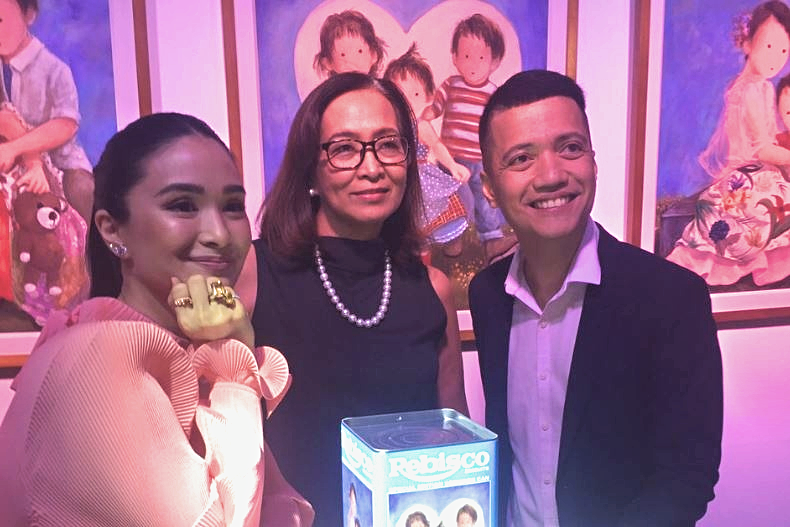 Local celebrity-painter Heart Evangelista-Escudero, together with DJ Chico Garcia, hosted the launch event and gave their full support and appreciation for the special edition designer cans as they got to know the artists behind the designs. Heart, who actually paints in her leisure time, checked out on the paintings of each artists. Amazed and proud, she got to mention that she was inspired to spend more time enhancing her skills in painting and feature Filipino culture. Contemporary artists Migs Villanueva, Aris Bagtas, Roel Obemio, and Joseph Banez collaborated with Rebisco to shine the light on Filipino artistry and culture in a tradition that Rebisco has created. Migs Villanueva, a Palanca-awardee visual artist, uses bold pastel colors and wanderlust compositions to invite Filipinos to see their own childhood experiences in her works. Aris Bagtas shows the Filipinos’ identity through his folk, religious and abstract works, inspiring people to create a country where family values, traits and traditions are not forgotten. Roel Obemio, a member of the famed Saturday Group, uses storybook characters and Filipino family-oriented imagery that convey whimsy and fantasy. Joseph “Otep” Bañez, who made his own brand of Filipino Pop-Social Realism that took the market by storm, creates detailed renditions combined with playful colors and hilarious settings. The new masterpieces are featured on the tin can’s outer packaging. There are four sets of special edition designer cans, and inside are assorted premium biscuits, crackers, cookies and wafers – all-time favorites that people love to snack on and share. Retailing for Php175.00 SRP, these are now available at leading supermarkets nationwide: Robinsons, Puregold, Waltermart, Rustans, and Shopwise. Starting November 15, 2018, you can also buy online via www.honestbee.ph.